OS X comes with an almost non-existent collection of games by default. You’ve got a really lackluster chess game that hasn’t been updated for over a decade… and that’s pretty much it. But did you know OS X has a secret game you’ve probably never seen, built right into the kernel of the operating system? It does, but don’t expect something on the level of Infinity Blade, or even Wolfenstein 3D… think more primitive. 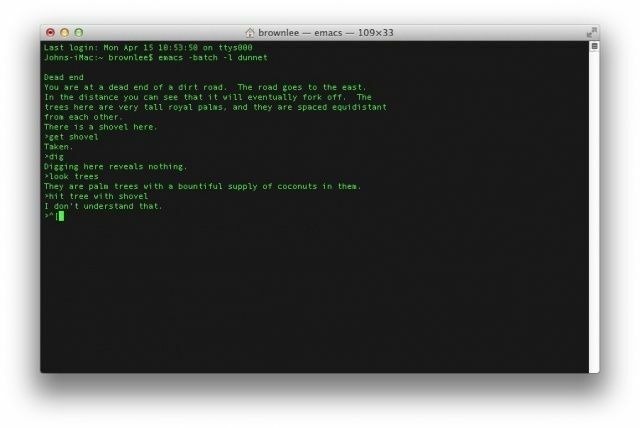 There’s a text adventure game built right into Terminal! The game is called Dunnet written by Ron Schnell, and it’s not exclusive to OS X: it ships on all every modern version of UNIX, upon which OS X is based. I haven’t gotten very far, but apparently, the game becomes quite surreal, and the major twist is that players are actually walking around inside a UNIX system, not a simulacrum of a real-life game world! Real-life people wandering around inside a UNIX system? Sounds pretty cyberpunk to me. If you’ve never played a text adventure, a la Zork or Hitchhiker’s Guide To The Galaxy, it’s pretty easy. Everything is done with text! You can, for example, type “get shovel” to pick up that shovel, or “east” to head east. “Help” will give you any other commands. This actually isn’t the only secret game you can play in your Mac’s Terminal: there are actually three of them, including a version of Tetris and a free psychoanalyst.